BE PREPARED. WINTERIZE YOUR HOME. 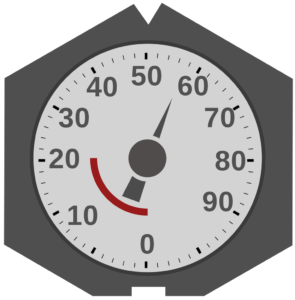 The above gauge currently reads at 60%. At 30%, you should call to schedule your fill. When the arrow gets into the red, you're at risk of run out and should call for a fill as soon as possible. A common question we receive after a fill is why was my tank never filled to 100%? Per law, tanks are only to be filled to 90% capacity to allow for gas expansion. To determine the amount of gallons left in your tank, simply multiply the percentage reading by the size of your tank. In the example above, 60% of a 500 gallon tank would be 300 gallons (.60 x 500 = 300). Remember, propane is an odorless gas, so to detect it's presence, a "rotten egg" odorant is added to it for your safety. This smell is sometimes present when a tank is run out but could also indicate a leak. Call Fick & Sons IMMEDIATELY should you smell propane. When a tank runs out of gas, any pilot lights on your appliances will go out which can be extremely dangerous. Should you run out of gas, it's important you take the following steps to minimize the potential for a hazardous situation. Turn off all control valves to your appliances and the shutoff valve at your propane tank. Call Fick & Sons immediately so a qualified technician can both refill your tank and check/light your appliances and system. NEVER attempt to put your system back into service yourself. For the safety of you and your family, Fick & Sons is required to do a leak check on any tanks ran to empty. Should you detect a "rotten egg" smell, evacuate the premises and turn off the shutoff valve on your tank. Call us IMMEDIATELY! Do not attempt to test for a leak with open flame, use rags or tape to stop a leak in gas lines, or do anything that could cause sparks (using electrical outlets, switches or appliances). Leaking propane can also cause the following symptoms: headaches, loss of muscular control, vomiting, watering of the eyes. If experiencing any of these, call us to have your propane system checked. It's important to be prepared for Michigan's long cold winters. Avoid letting your tank run low before the cold weather hits, we recommend calling when your tank is at 30%. This gives us time to place you on the schedule for delivery before risk of running low (or even out!). Running your tank low creates the risk of a run out, which will cause a loss of pressure in your system and create a hazardous situation for you and your family. In order to be filled, tanks that are run out will need to have the lines repressurized and tested. It's a best and safe practice to avoid ever letting your tank run below 10%. The Michigan Propane Gas Association provides a list of do's and dont's of home heating safety. Remember, we're here to answer any questions you may have about your propane services. DO know the layout of your gas service lines, particularly if doing any landscaping/renovations. DO clean your furnaces regularly. DO have your range serviced if the flames are not blue. Yellow flames indicate blockage. DO have all propane appliances tested regularly by one of our qualified technicians. DO make sure there is always plenty of ventilation. DON'T connect portable cylinders to home heating systems to heat your home. DON'T use propane heaters that are intended for outdoor use. DON'T tamper with safety devices, regulators. DON'T store propane inside homes, garages and barns. LET US EASE YOUR WORRY. ASK ABOUT OUR KEEP-FULL PROGRAM.